Hugh Hewitt: "Benedict XVI: CEO"
Hugh Hewitt posts a sort seven-habits-of-highly-effective-people take on the Pope's visit, based on Hugh's talk last week to the Orange Catholic Foundation's annual Conference on Business and Ethics. It's an interesting read, and departure from the standard commentary on the Pope's visit. Bill Maher: "I think that there is no perspective. People have no perspective, especially about crime. You know, zero tolerance. You know, of course, nobody ever wants to see a child, you know, diddled. That’s just plain wrong. But even the people who are testifying against him, they’re saying that he serviced them. They didn’t service him." Craig Ferguson: "You don’t have kids, do you, Bill?" Ferguson: "No. I have a son. It makes me crazy, this thing, this Michael Jackson thing. It drives me, the idea of someone touching my kid, I would go, I nearly swore there. I’d go crazy." Maher: "Very wrong. But, you know, I remember when I was a kid. I was savagely beaten once by bullies in the schoolyard. Savagely beaten. If I had a choice between being savagely beaten and being gently masturbated by a pop star. It’s just me." Ferguson: "The always controversial Bill Maher, everybody." Ferguson: "Bill Maher. We’ll be right back with Rain Pryor." Catholic members of Congress who publicly support the right to abortion will trek to Nationals Park Thursday for a Mass celebrated by a pope who has said such lawmakers should not receive Communion. Leading these lawmakers, some of whom have repeatedly complained about remarks by Pope Benedict XVI and a few bishops on the subject, will be House Speaker Nancy Pelosi, the government's highest-ranking Catholic and a supporter of abortion rights. Nowhere in her remarks or her actions this week has she referred to strains with the new pontiff. Instead, she bent to kiss his ring at the White House Wednesday as Benedict arrived in a blaze of pageantry, and later she spoke glowingly on the House floor about his commitment to truth, justice and freedom. A week before he arrived, the House passed a resolution welcoming him to Washington. And yes, her spokesman said, she intends to receive Communion from one of the 300 priests and lay ministers who will offer it to the gathered flock of 45,000. Benedict's stance on abortion and Communion has been painful for elected officials who inhabit the troubled zone where Catholicism and their political beliefs intersect. Pelosi was one of 48 Catholic lawmakers—some who support and some who oppose abortion rights—who signed a letter in 2004 complaining about statements by "some members of the Catholic hierarchy." "If Catholic legislators are scorned and held out for ridicule by Church leaders on the basis of a single issue, the Church will lose strong advocates on a wide range of issues that relate to the core of important Catholic social teaching," they wrote. "Moreover, criticism of us on a matter that is essentially one of personal morality will deter other Catholics from entering politics, and in the long run the Church will suffer." None of the Catholic lawmakers interviewed Wednesday said they hesitated to attend Thursday's celebration of Mass. This event, they said, is about bigger themes and values, such as hope and compassion. 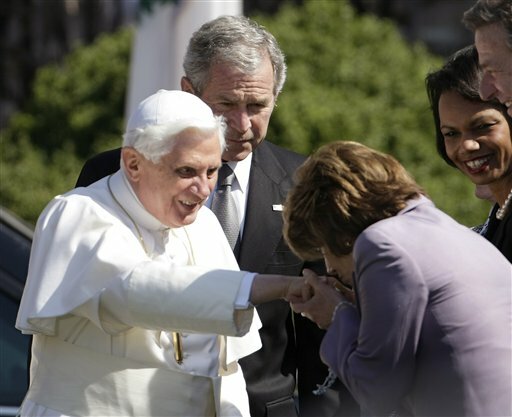 "Pope Benedict's historic visit is an important opportunity for Catholics and for all Americans to reflect on the ways we can contribute to the common good, address global issues of poverty, disease and despair," said Sen. John Kerry, D-Mass., whose views in 2004 led several Midwestern bishops to say they would deny the Democratic presidential nominee Communion. "In a nation and a world facing such extraordinary and daunting challenges, the pope's visit promises hope, inspiration and great wisdom," Kerry said in a statement. These pro-abortion "Catholic" politicians are shameless and they don't seem to fear God's judgment. It's both upsetting and embarrassing. 2. The Church teaches that abortion or euthanasia is a grave sin. 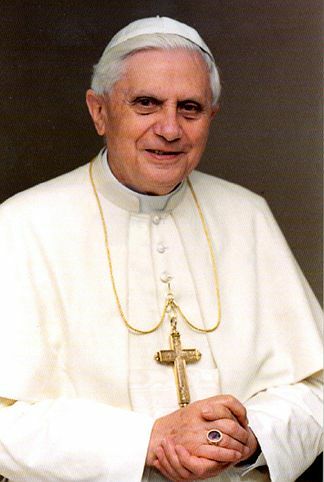 The Encyclical Letter Evangelium vitae, with reference to judicial decisions or civil laws that authorize or promote abortion or euthanasia, states that there is a "grave and clear obligation to oppose them by conscientious objection. [...] In the case of an intrinsically unjust law, such as a law permitting abortion or euthanasia, it is therefore never licit to obey it, or to 'take part in a propaganda campaign in favour of such a law or vote for it’" (no. 73). Christians have a "grave obligation of conscience not to cooperate formally in practices which, even if permitted by civil legislation, are contrary to God’s law. Indeed, from the moral standpoint, it is never licit to cooperate formally in evil. [...] This cooperation can never be justified either by invoking respect for the freedom of others or by appealing to the fact that civil law permits it or requires it" (no. 74). Following is the text of the address the Pope gave in the Rose Garden of the White House this morning. I hope secular media reporters and pundits paid close attention, because this is a Pope who understands America: it's history, the principles of it's Founding, and the attributes that make it great. I'd say the Holy Father understands our Founding principles better than 75% of the members of Congress. "Mr. President, thank you for your gracious words of welcome on behalf of the people of the United States of America. I deeply appreciate your invitation to visit this great country. 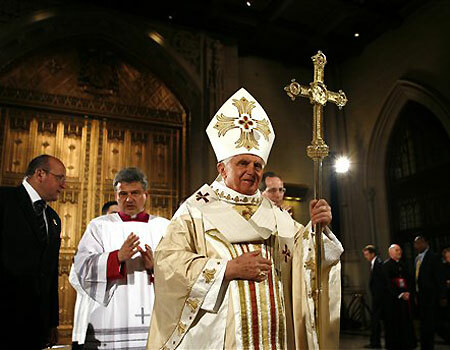 My visit coincides with an important moment in the life of the Catholic community in America: the celebration of the two-hundredth anniversary of the elevation of the country's first Diocese -- Baltimore -- to a metropolitan Archdiocese, and the establishment of the Sees of New York, Boston, Philadelphia and Louisville. Yet I am happy to be here as a guest of all Americans. I come as a friend, a preacher of the Gospel and one with great respect for this vast pluralistic society. America's Catholics have made, and continue to make, an excellent contribution to the life of their country. As I begin my visit, I trust that my presence will be a source of renewal and hope for the Church in the United States, and strengthen the resolve of Catholics to contribute ever more responsibly to the life of this nation, of which they are proud to be citizens. John Allen of the National Catholic Register posted a transcript of the papal Q & A aboard Shepherd One during the flight from Rome to the U.S. 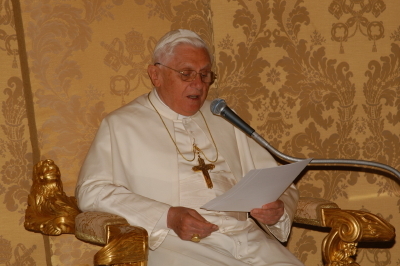 Among other topics, Pope Benedict XVI addresses the clergy sexual scandal.